Does anyone have any input in this topic? I actually agree with Nebit on the topic of picking out foods, but I know my opinion on that is not very popular here. But I also wouldn't choose to feed a mix that had a large amount of sunflower seeds or peanuts (neither of the mixes mentioned have a huge amount - much less than some I've seen). On the corn thing I find a lot of mention but nothing definite. I've seen articles that say studies supposedly proving it are inconclusive due to their methods. Though I'll be the first to point out that there's a very real chance I'm misunderstanding or completely missing something. But again, I personally wouldn't choose a food that was mostly corn (neither foods mentioned in that thread look to be anyway) but I also wouldn't recommend picking it out. Some corn is no big deal. Heck, a lot of corn is probably no big deal but it seems to me those mixes (with mostly corn) tend to be lower quality all around. Vitakraft Complete Nutrition Rat, Mouse & Gerbil Food is way too high on crude protein for the average pet mouse and doesn't have much variety. Higgins Sunburst hamster/gerbil is a touch high on crude protein and has much better variety. Edit to add: I was just playing around with numbers and adding 1/2 pound each of rolled oats and barley effectively lowers the crude protein a little, with still keeping fat and fiber ok. Just a thought. The fact that VitaKraft is the same price is what's throwing me off though. They are pretty much equally priced, so which one would you pick? Honestly, I'd be much more comfortable with feeding something I know is recommended and doesn't contain ingredients that are generally recommend against. They are the same price, would you feed the recommended food or the food that is slightly off on GA and contains *questionable* ingredients? I personally -if I had to choose between the two- would pick the parakeet and add things to it. The parakeet mix honestly doesn't have much in the way of variety. Thinking on this line some more, I may even consider mixing the two together. Yes there's some questionable ingredients in the Higgins but they're low on on the list and mixing in the parakeet would bring it even lower, while doubling the variety. The resulting mix would be 14% crude protein, 6% crude fat, and 9.7% crude fiber. Another option, in my mind, would be to mix a mouse food with the parakeet. Vita parakeet + Nat Geo mouse (13.9%CP, 4.7%fat, 11%fiber) or Vita parakeet + Brown's mouse (13.5%CP, 6%fat, 9.5%fiber). Both increase variety quite well, doubling it with Nat Geo and even more with Brown's. Or just mixing in other grains and seeds of my choosing, which will give you varied results depending on how much and what you're adding. Ok, honestly I was just going by what I learned from this forum, and when they said they got their information of that food being good from Pet Mouse Fanciers, I got confused, because I don't remember anyone asking about that food here. While I do agree Higgins has more variety, I don't think VitaKraft is low on variety, but that's just my opinion. Vita Prima parakeet (at least the version linked in the diet thread) has 11 whole ingredients which sounds pretty decent but all but 4 of those ingredients are added after calcium carbonate, suggesting there's very little of them. I edited my last post to add a bit more of my opinion on what I might add in before I realized you had replied. Maybe a Mod could move these to their own thread in Nutrition? Not sure if this fits here. I made this its own thread. I would have put it in Random Thoughts but it's too much work. I haven't read that whole thread yet, but I don't remember recommending Higgins. Is that a Walmart food? These info threads are like 10+ years old. I haven't done the research to update them, but if anyone is interested in updating outdated info and/or adding other useful info, let me know! Higgins can be found at Petsmart and sometimes Petco I believe. I don't think they were saying someone here specifically recommended Higgins Sunburst, just that they used this forum combined with many other sources to decide what they felt was best. @Peachy I'm not sure what should be added or changed in the Diet thread. But it may be good to add that studies pointing towards corn being linked to cancer have since been found to be inconclusive. Also remove that bit suggesting to pick corn out. We could maybe add a little info about paying attention to the variety of whole ingredients in the mixes you choose? I feel that's just as important to think about as the GA. Maybe mention the possibility of mixing 2 or more commercial foods together to get more variety and how this can also tweak the GA to a better range? Maybe expand a little more on the healthy treat/supplement section? I feel like it's already pretty clear on the allergy concerns and doesn't actually say to pick items out for all mice. It just mentions that some mice do develop allergies to those foods and may need a diet without them - but not all mice. It could be suggested to try to keep these things lower on the ingredients list if at all possible. That bit on yogurt drops causing mice to "bleed out of several orifices" --- Anyone have any idea where that came from? It seems ridiculous to me. I mean, I agree that they're not healthy treat being mostly sugar, though they do make a sugar free variety! That's all I can think of right now. Anyone else have anything to add? @CallaLily wrote: though they do make a sugar free variety! They discontinued these! I went to link them yesterday and had trouble finding them so I emailed the company. They discontinued them due to lack of interest! Darn. You mean these: http://www.notjustpets.co.uk/vitakraft-small-animal-sugar-free-yogurt-drops-75g-p-1359.html ? Yes, Vitakraft. Are they still available in the UK? However, I can not find them for sale in the US. I've wanted to add something about ingredients under "Nutrients" for a while but never got to writing it. It might take a couple days but I'll definitely get to it! 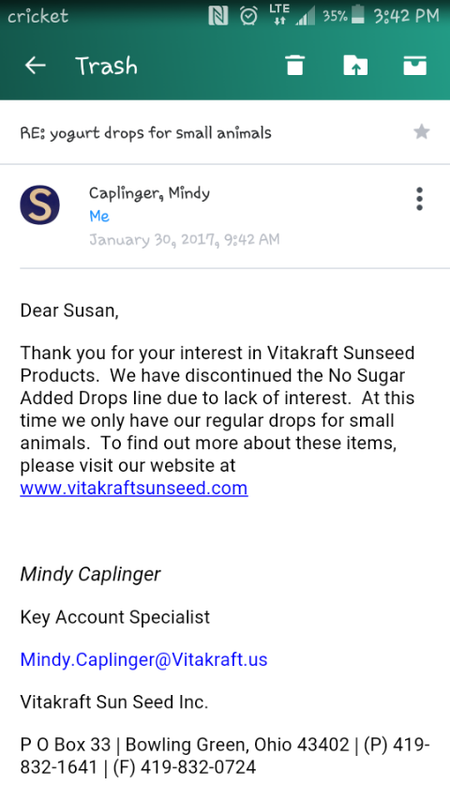 What do you think should be added to the Treats and Supplements part? I've edited and reworded the Oxbow bit, the corn section, and I took out the yogurt drops thing. It always sounded a little weird to me, too, but I've never wanted to try feeding them enough to do my own research on them. Though just now, I found a recipe to make your own! Too bad the sugar-free variety got discontinued. Edit: Oh, and have you seen my "5 great mouse treats" thread? You can use any of the information I wrote there if you'd like.